WWI soldier's violin played at his grave | LEARN TO PLAY THE VIOLIN FOR FREE! ← Learning the Violin as an adult – it’s possible! 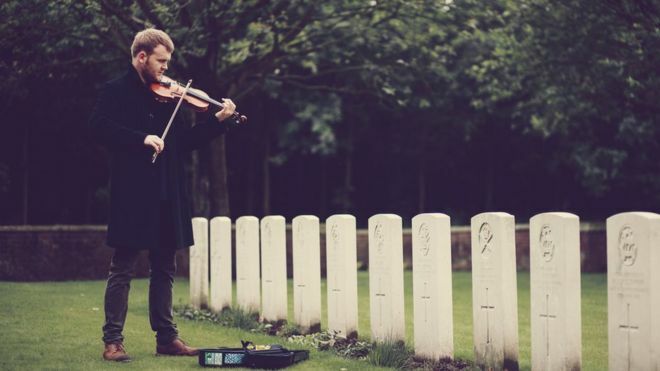 A violin made by a soldier killed in battle during World War I has been played at his grave on the eve of the 100th anniversary of his death. Richard Howard, who died on 7 June 1917 in the Battle of Messines, started making the instrument in 1915 before enlisting in the army. It was later finished by a luthier in Oxford before being bought by folk musician Sam Sweeney in 2009. Had tears in my eyes the moment I read the title, didn’t expect to be full on crying before I could get through the story. Struck a nerve I guess. The album Unfinished Violin by Sam Sweeney is absolutely beautiful and deserves to be heard, much like the violin that inspired this album.